If you have your own web site or blog, you can help spread the word about the Photo Archive. I have created banners in many popular banner sizes. Just scroll down this page to the size that best works for your web site, and copy the HTML code shown in to your site. You don't need to download the image file, it will automatically be served by my server if you use the HTML code shown. If you have any trouble getting the banners to work on your web site, please contact me, I'll be glad to help out. 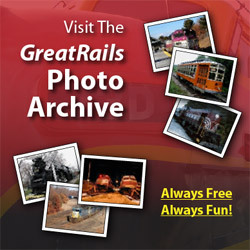 Visit the GreatRails Railroad Photo Archive!